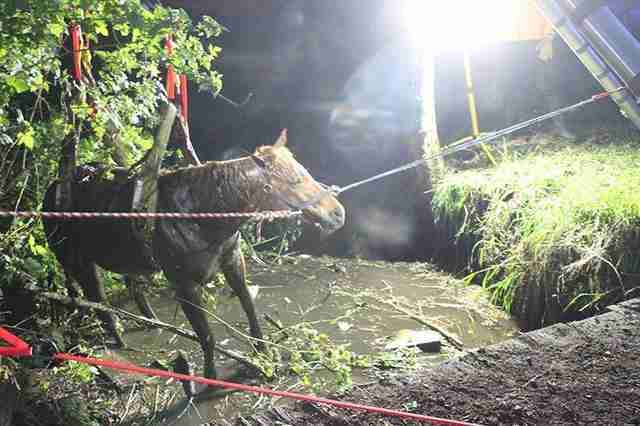 Honey was growing more and more desperate with every attempt to free herself from a muddy creek. She couldn't get a grip on the slippery embankments to pull herself out. 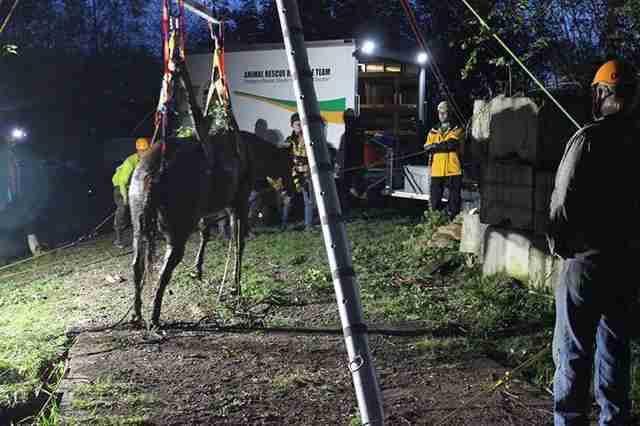 When Washington State Animal Response Team (WASART) received the call about the horse, the team rushed to the woods where she lay, scared and exhausted. 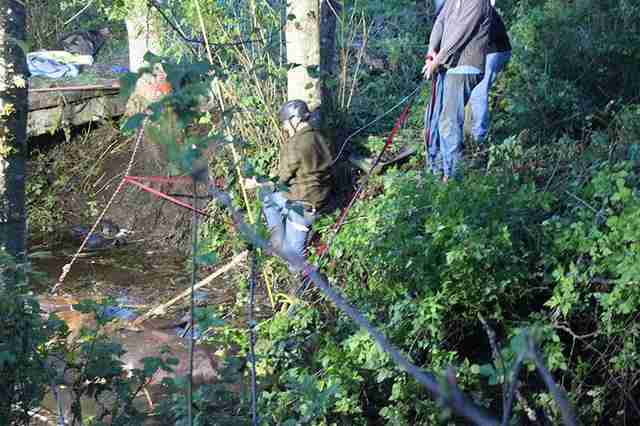 There was just about an hour of daylight left when rescuers arrived. "The creek cut deep into the silt of the ground and the soft muck on the bottom of the creek made the situation dangerous," WASART wrote on Facebook. 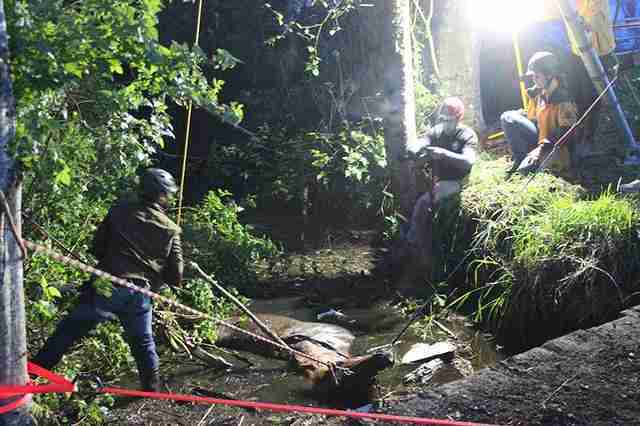 It was too dangerous to put a rescuer down in the mud with Honey - her flailing could have injured anyone trying to help her and no one, human or horse, could keep upright in the slippery mud. "JC, one our best horse handlers, would be attendant to the horse, meaning he'd work closest to her and try to keep her as calm as possible," WASART wrote. "He stood on the steep bank, talking to Honey." 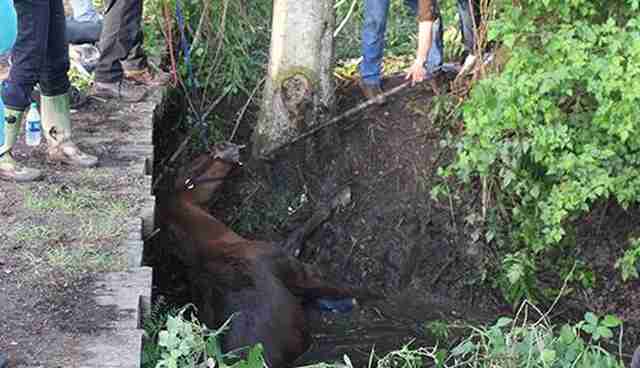 As rescuers prepared a complex system of ropes and harnesses to try to pull the horse up from above, a veterinarian stood by with a sedative in case Honey started panicking. 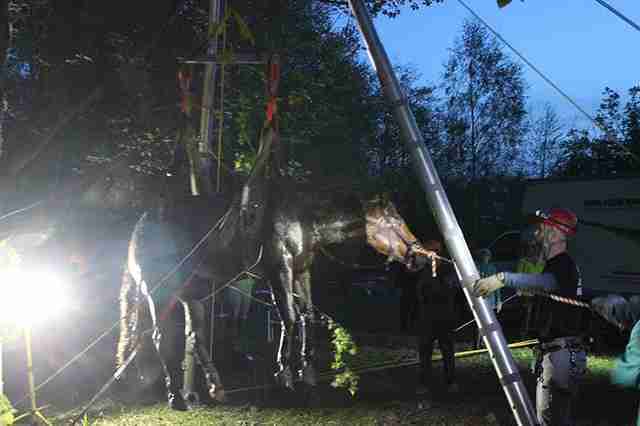 After gaining Honey's trust, JC helped put support straps under Honey using a special guide that slid under the horse. 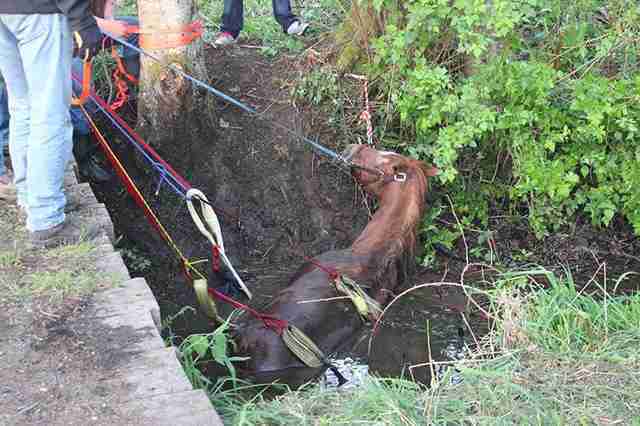 "Honey's continued attempts to self-rescue made this difficult." 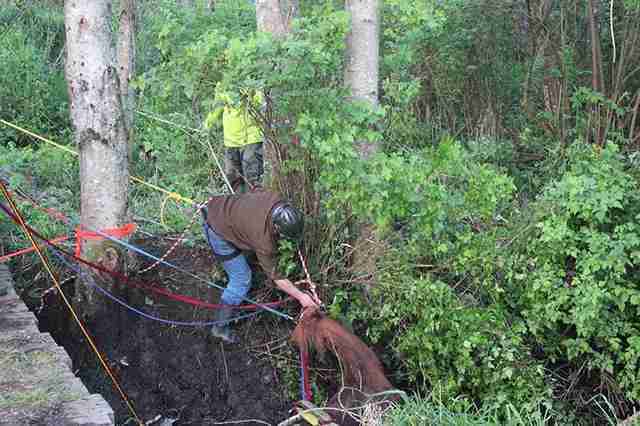 Meanwhile, other members of the rescue team built a "bipod," a device that would help lift Honey up from above. "We were ready to go just as dark descended," WASART wrote. 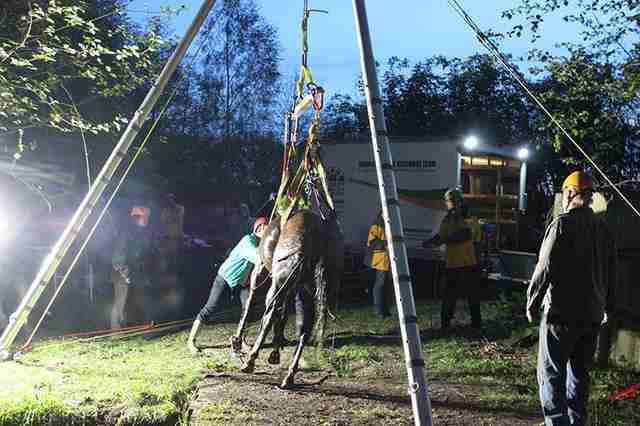 Under spotlights, the rescue team started to lift Honey. 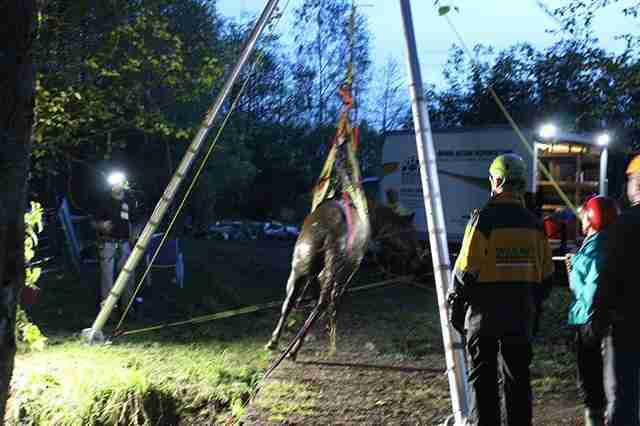 This can be dangerous, since horses have very delicate legs and being lifted can cause horses to thrash around in fear. 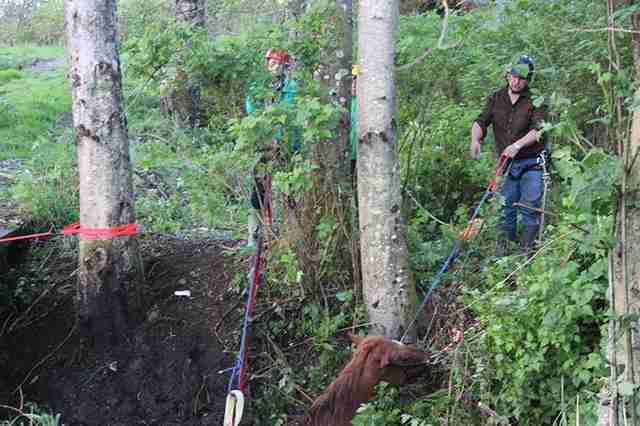 "Honey cleared out of the water fairly easily, and seemed calm," WASART wrote. "However, once in the air, she thrashed and we were very glad of the careful rigging which kept her and everyone safe." But just before Honey touched solid ground she got spooked and stared thrashing again. The veterinarian came in with the sedative so Honey wouldn't hurt herself at the very last moment. "We continued to lower her. The sedative kept her from noticing the ground right away, but as soon as she did, she stood and was able to bear weight on all four legs." 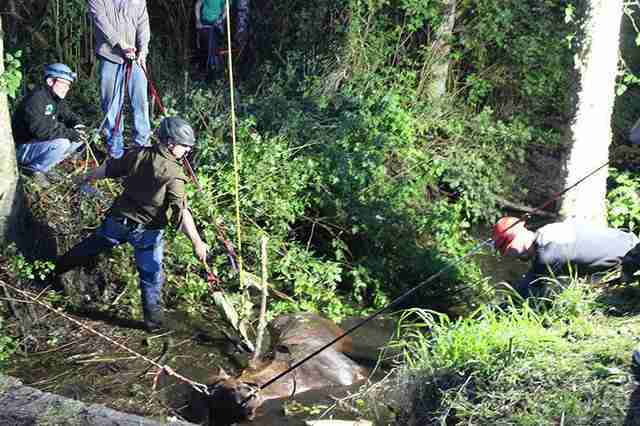 Rescuers breathed a sigh of relief to see that Honey could stand on her own. After her epic rescue, Honey went to rest and be examined more thoroughly for injuries. Miraculously, she seems to be largely unharmed. "We've heard Honey has a few scrapes and scratches but is doing well," WASART wrote. Click here to support WASART and its incredible rescue work.